We wish to thank the following for their help in writing this chapter: Professor Mehmet Ali Cullu, University of Harran, Department of Soil Science, Sanluerfa, Turkey; Dr. Manzoor Qadir, ICARDA, Aleppo, Syria; Dr. Chris Smith, CSIRO, Canberra, Australia; Dennis W. Westcot, formally California Regional Water Quality Control Board, Central Valley Region, Sacramento, California; Douglas E. Davis, Tulare Lake Drainage District, Corcoran, California, Michael L. Delamore, formally U.S. Bureau of Reclamation; William (Bill) R. Johnston, formally Westlands Water District, Fresno, California; Sarge Green, Westside Resource Conservation District, Fresno, California; and David Cone, Southern San Joaquin Valley Water Quality Coalition, Fresno, California We also thank Debra Silva for her help with text editing. CVRWQCB (Central Valley Regional Water Quality Control Board). (1988). 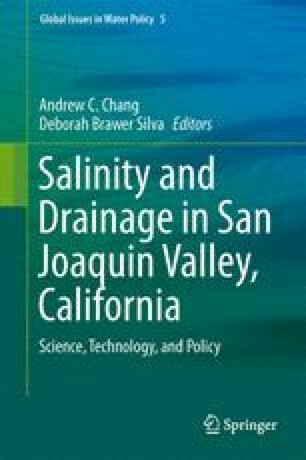 The modification to beneficial uses and water quality objectives necessary for the regulation of agricultural subsurface drainage discharges in the San Joaquin Basin (5C) (Staff Report, 30 pp.). Sacramento: California Regional Water Quality Control Board, Central Valley Region. http://www.swrcb.ca.gov/rwqcb5/water_issues/swamp/historic_reports_and_faq_sheets/1988_bpa/beneficial_use_wq_obj.pdf. Accessed 23 June 2013. MDBC (Murray-Darling Basin Commission). (2006). Interstate water trade and salinity (MDBC Fact Sheet 6, May, 2006, 2 pp). http://www2.mdbc.gov.au/__data/page/114/MDB3614_Fact_Sheet_6.pdf. Accessed June 2012. MDBC (Murray-Darling Basin Commission). (2012). About MDB initiative. http://www2.mdbc.gov.au/about/index.html. Accessed June 2012. Quinn, N. W. T., Linneman, J. C., & Tanji, K. K. (2006). The San Joaquin Valley westside perspective. Presented at the World Environmental and Water Resources Congress, 22–25 May 2006. Omaha: Lawrence Berkeley National Laboratory, LBN−60613, 27 March 2006. Berkeley: Lawrence Berkeley National Laboratory. http://www.escholarship.org/uc/item/6c92s39s#page-2. Accessed 23 June 2013. Robie, R. (1988). The State Department of Water Resources, 1975–1983. California oral history (54 pp). eBook and Text Archive, California Digital Library. http://archive.org/details/statedeptwater00robirich. Accessed June 2012.